Options for comfortable outdoor entertaining have expanded in recent years to include furnishings and appliances that are designed for both function and style. 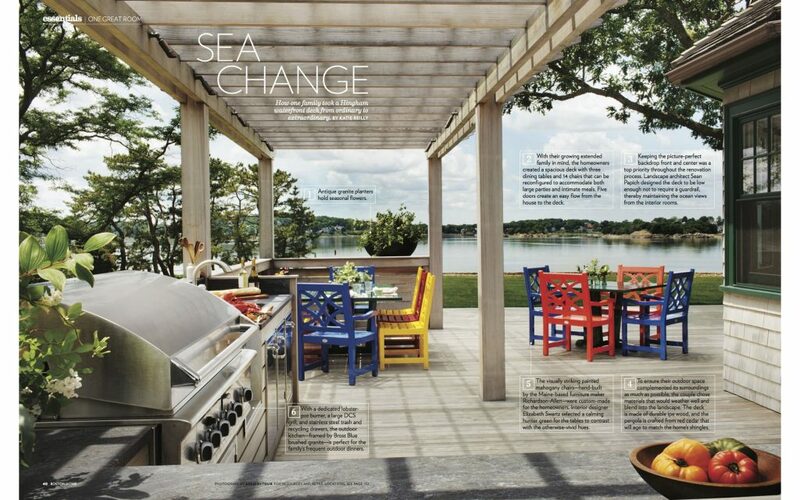 In this Boston Home article, a Hingham, Massachusetts waterfront deck designed by Boston interior design firm Elizabeth Swartz Interiors is equally comfortable as the setting for a large gathering or a small intimate dinner. The family is known for hosting lobster dinners, so included in the design of this outdoor kitchen are a dedicated lobster pot burner and oversized grill, as well as stainless steel cabinets and granite counters. The mahogany chairs were brightly painted with a marine-grade finish creating a festive and inviting setting overlooking Hingham harbor.